Aromatherapist and book author Mary Muryn’s childhood was filled with talks of Gypsies’ unerring predictions. The future was not a mystery in Ukraine - one simply had to ask. Mary’s grandmother lived in the Carpathian Mountains and was said to be a psychic and a witch doctor. The people there did not believe in doctors (or have any to go to); if you were ill you went to a witch doctor or healer. They had old knowledge of flowers, herbs, and roots, and could cure any disease, even cancer. Aloe Vera was used as a popular cure for stomach ailments, and every home grew its share. By sharing recipes like the one below, we want to bring natural traditions back into the modern world. This can be done by tuning out of technology and integrating into nature. We simply utilize products that come from the earth, such as herbs, flowers, and salts. The combination of good for our insides and outsides can bring back that dampened spark of intuition. A good friend once said, once I started looking after my gut I felt almost clairvoyant. Although we do not recommend you drink your bath water we do suggest sitting in it with a bunch of goodies from a Mary Muryn recipe. Purpose: We call them Psychic Vampires – the people who seem capable of draining our vitality and love force. Sometimes they appear to do it on purpose, other times they are simply so depleted that they drain our batteries without meaning to. 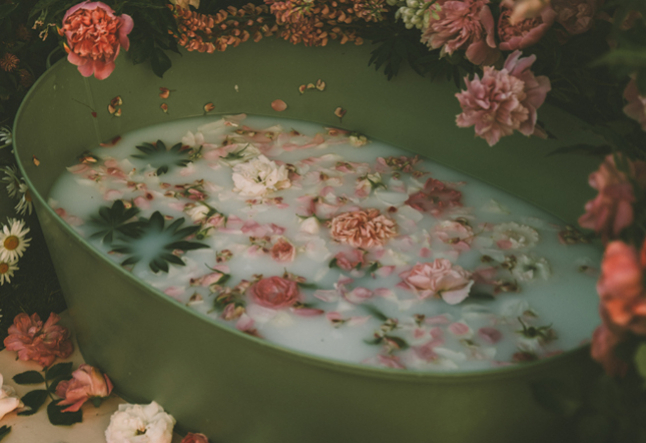 When you have been with such a person there is a simple bath that can replenish you and recharge your psychic batteries. How to: Fill the tub with warmish water, add the vinegar, and soak for twenty minutes. Afterward, if you can we recommend heading outdoors barefoot, even if it’s just for a few seconds. Ground the negativity you’ve been in contact with. Imagine the negativity flowing out of you… through your feet, down, down into Mother Earth, where she will purify and transform it into useful energy again. Do not go to bed for at least an hour after this bath. Your body needs to rebalance itself, so just relax and treat yourself to some pleasurable activity, like reading or listening to music. You need to refill your reservoir and remind yourself of your own worth as a child of the universe. Often we are tempted to let needy people drain us, but that is not as the universe intended. Each of us is sacred and has an obligation to protect and preserve both body and spirit.